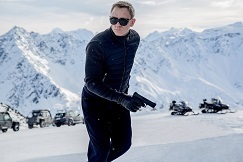 Proving once again the 007 franchise's ability to endure across the generations, 24th Bond movie Spectre has shattered box office records in spite of somewhat middling reviews. Undeniably overshadowed by its superior predecessor Skyfall, which expertly mixed humour, action and a thrillingly emotional look at the world's most famous secret agent, Spectre takes a somewhat more frivolous, flippant approach to Daniel Craig's Bond, throwing back to the tongue-in-cheek campery of Roger Moore and Pierce Brosnan. With esteemed American Beauty director Sam Mendes back at the helm, the story kicks off with a spectacular sequence set during Mexico's Day of the Dead festival in which Bond trails and ultimately executes a notorious figure in the employ of the eponymous criminal organisation. Butting heads with the new M (Ralph Fiennes), whose '00' program is on the verge of being closed down by supercilious new security chief C (Andrew Scott), Bond goes rogue on a global search for the mysterious Franz Oberhauser (Christoph Waltz), with whom he shares a deep-seated personal connection. On his quest, Bond will come into contact with Madeleine Swann (Lea Seydoux) who may ultimately help redeem his life of violence. With a starry cast also including Monica Bellucci, Dave Bautista, Ben Whishaw, Naomie Harris and Rory Kinnear, plus luxurious cinematography from Interstellar's Hoyte Van Hoytema, there's no denying Spectre is worth every penny of its enormous $300m budget. Even so, with a tonally confused story that veers haphazardly between jokes and seriousness, plus a series of climactic reveals that fail to resonate as effectively as they should, there is a distinct sense of it lacking both the visceral danger and emotional heft of Skyfall and Casino Royale. 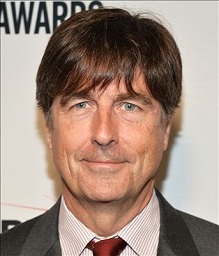 Thankfully, one area where the movie isn't lacking is the music by Thomas Newman, who returns to Bond duties following the Oscar-nominated Skyfall. Including the aforementioned score, Spectre is Newman's sixth collaboration with director Mendes following American Beauty, Road to Perdition, Jarhead and Revolutionary Road. As a celebrated composer of somewhat quirkier and more emotional material (other notable examples include The Shawshank Redemption, Angels in America and Finding Nemo), Newman still remains a controversial appointment for the franchise, many fans continuing to deride his apparent lack of fidelity to the classic Bond theme in the Skyfall score. Certainly when compared David Arnold's bolder energy on the preceding Daniel Craig and Pierce Brosnan movies, and also the lushly romantic approach of series father John Barry, Newman's work is perhaps less overt than many fans will have expected. 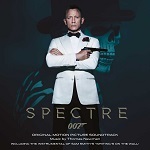 Nevertheless the criticisms over his use of the Bond theme are somewhat nonsensical: the theme was all over the Skyfall score, not always overtly but certainly creatively, and that approach very much applies to Spectre, which in-keeping with the movie's central notion of the past catching up is closely tied into Skyfall's musical ideas. In fact, it's surprising to hear how much of Skyfall's material is referenced in Spectre; at the same time, Newman is far too accomplished a composer to use said ideas as a crutch. Instead, it's best to see both scores as two sides of the same Bondian coin: a musical depiction of the past, present and future. When it comes to Spectre itself, the Bond theme first makes a forceful, brassy appearance in the opening "Los Muertos Vivos Estan", subsequent applications ranging from the slyly knowing bass flute intonations in the opening moments of "The Eternal City" to the spine-tingling choral interpretation midway through "Backfire", the steady build-up of "Safe House" and the relentlessly exciting statement in "Snow Plane". Surely its biggest crowd-pleasing moment comes in the hugely dramatic "Westminster Bridge" whose squealing horns recall John Barry at his finest. What Newman does brilliantly is avoid using the theme as a glib, predictable signifier of something heroic: instead he deploys it very carefully, looking to see how it can extend the emotional impact of a given track in the most memorable way possible. This being a Newman score the soundscape is remarkably rich and compelling, enveloping the listener in a near-constant tapestry of exotic-sounding instruments, percussion and shimmering electronic embellishments. Tracks like "Vauxhall Bridge" demonstrate this perfectly. Later on, "A Place Without Mercy" adds resonant horns and urgent strings to flesh out the sense of danger that Bond faces in his latest mission, whilst the slow-burning tension of "The Pale King", "Silver Wraith" and "Kite in a Hurricane" (the latter with ghostly choral accompaniment) hint at nasty secrets lurking in the shadows. These are the sort of tracks that will likely challenge those looking for a more incessant, less considered and less thoughtful Bond score, but they do serve to heighten the impact of the action sequences when they arrive. On that note, the action is plentiful and masterful. The powerful horns in "Backfire" are a memorable accompaniment to the glossy night-time car chase in Rome; the adrenaline-pumping "Snow Plane" is built around a jittery little string/percussion motif that eventually gathers the full force of the brass section for a truly ear-shattering climax; "Hinx" is brief but aggressive; "Tempus Fugit" reinstates Skyfall's climactic action material; and the sucker-punch finale of "Careless" and "Detonation" teems with suspense, both built around the pulsating electronic rhythm of Skyfall's "The Moors" track. A more oblique, structural reference to Skyfall comes in the awe-inspiring, choral-led "The Eternal City", a companion piece cue to the former's "Brave New World" in that the music transports us from one area of the world to another (Rome replacing Shanghai in this instance). The latter half of "Backfire" also integrates the opening Skyfall Istanbul chase material, a clever way of suggesting the potentially inescapable cycle of action and violence that Bond finds himself in. Source cue "Day of the Dead" meanwhile features a rambunctious, dynamic arrangement of percussion and vocals courtesy of Latin American percussive ensemble Tambuco. Another enjoyably exotic flavour comes in the fleeting "L'Americain" with its alluring Middle Eastern textures. 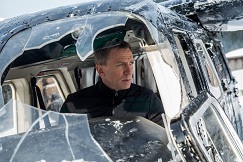 One area in which Spectre does have a slight edge over Skyfall is in its romantic material. With the narrative hinging on the presence of two important women characters, Newman is allowed to dip into his revered ability for string-led melody, the tragically-tinged "Donna Lucia" eventually giving rise to a new Bond/Madeleine love theme that carries us through the rest of the score. Preceded by a classically sweeping, Barry-esque piece in "Crows Klinik", the beautiful "Madeleine" is as sensitive and poignant as one would expect from this composer, humanising Bond's character and suggesting that he has a possibility of a future beyond the secret service. Later statements in the haunting "Secret Room" (whose piano-led tones recall Newman's finest work) and the sumptuous climactic double-bill "Out of Bullets" and "Spectre/End Title" help bring the piece to a fulsome, satisfying conclusion. 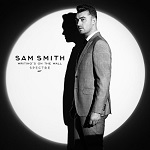 What is absent from the soundtrack album is Sam Smith's chart-topping title song "Writing's on the Wall" although Newman does include an instrumental (and presumably obligatory) adaptation of the main melody during a crucial romantic moment between Bond and Madeleine. Next to the more appealing tonalities of the love theme, the material for Christoph Waltz's elusive baddie is somewhat amorphous and harder to identify, boiling down to ominous brass progressions in the likes of "A Place Without Mercy", the eerie "A Reunion" and "Blindfold". (The awkwardly structured, long-delayed reveal of Oberhauser in the movie likely doesn't help the score in this regard.) In the perhaps unlikely event that Newman was to score another Bond movie featuring Waltz's character, one could hope this material would take on more of a distinct identity. For all its strengths, there's no denying Spectre makes for a lengthy album that may initially prove frustrating and even alienating on first listening. Perhaps the greatest disappointment, as with Skyfall, is that the score ends without a final grandiose statement of the Bond theme, petering out when it should end on a high. Even so, it's not enough to railroad what is another commendably intelligent, refreshing and compelling effort from one of the finest film music composers in the business. What made Skyfall impressive was Newman's ability to fuse his own distinctive sound (one of the most idiosyncratic in the business) with the classic approach of John Barry and the more recent, pulse-pounding stylistics of David Arnold. It was an effort that felt both uniquely Newman and uniquely Bond, and the same can be said of Spectre, although as always with this composer's scores it doesn't offer immediate gratification in-between the more attention-grabbing moments. That said Newman shows a better grasp of what's needed than many of the previous "guest" composers like Eric Serra, whose largely derided, metal percussion-driven effort for 1995's Goldeneye completely lost sight of the classic series sound. For someone who has overtly stated that his role as a film composer is to hold back and underscore the action where possible, it's thrilling to see how successfully Newman has spread his wings on the two Bond movies, blending his signature sense of style with the needs of the franchise. Whether or not Spectre is set to be his last Bond score, Newman has indelibly left his mark on the series. The score is available as both a CD release and for download, through links such as these on: Amazon.com and Amazon.co.uk. Sam Smith's Writing's On The Wall can be found at: Amazon.com and Amazon.co.uk.